With PowerPoint there comes a time when you wonder whether all your presentation design choices will really pay off. Will your slides actually work in front of an audience? When this is the case, then ​it's time for a PowerPoint presentation review. This can be a challenge at the best of times. And when you have the pressure of time working against you it can be very tough. We believe we can help with an online PowerPoint presentation review session. When you are happy with your presentation slide deck you should feel your confidence flow…comfortable with just about everything in your presentation. So, reviewing your presentation with someone else will give your confidence a real boost. With a third party's overview you can be assured of some real insight into your slides. Book one of our PowerPoint presentation review slots…and make your presenting task that much easier. Because it's that simple. Are you confident with your presentation slides? Can you predict your audience's reaction to your slides? Are you looking for some constructive feedback on your presentation? Need some useful help with your presentation? 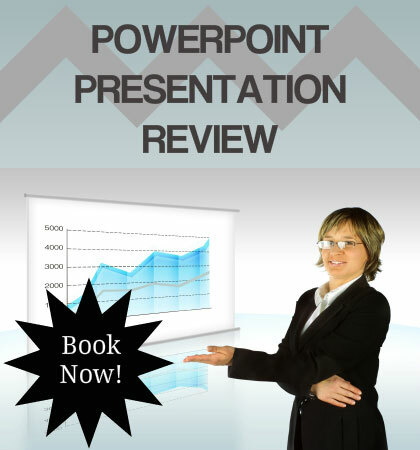 Book a PowerPoint presentation review slot. To get going simply complete the form and we'll sort out the rest. PowerPoint presentation review sessions are priced at £50 for one hour duration or £75 for two hours duration. You will need telephone line access for the review session. We will provide you with a dial-in number for the session. Once you've uploaded your presentation, we will also supply you with a web link so that both you and your presentation coach can work with your presentation. "If you live only for yourself you are always in immediate danger of being bored to death with the repetition of your own views and interests.